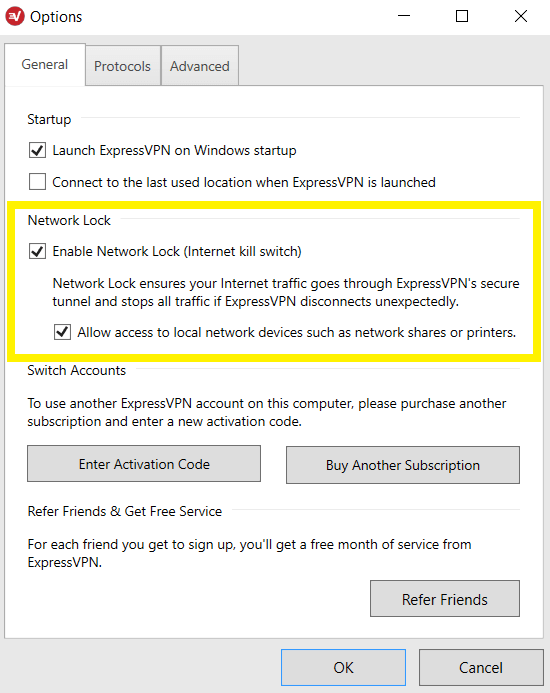 Network Lock is ExpressVPN’s kill switch and is designed to protect your internet privacy. Read on to find out what it does and how it works. Have more questions about VPN? Contact the ExpressVPN Support Team for assistance. To learn about similar protection for Android, please visit this page. How does Network Lock work? When is Network Lock active? A VPN encrypts and hides your network traffic from third parties. However, even the best VPN connections can fail, leaving your internet traffic exposed. 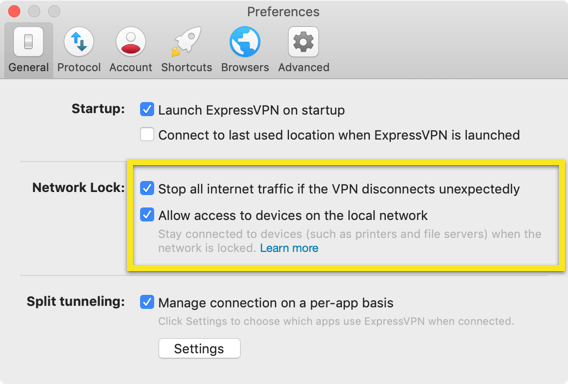 Network Lock solves this problem by automatically stopping all traffic from entering or leaving your device if you are disconnected from a VPN server location. This prevents your network traffic from being exposed to prying eyes. Read more about Network Lock. Network Lock becomes active as soon as you attempt to connect to a VPN server location, and it will remain active until you choose to disconnect. This means that if your VPN connection drops for any reason, Network Lock will immediately engage and block any internet traffic to or from your device. The traffic will remain blocked until the VPN connection is restored. 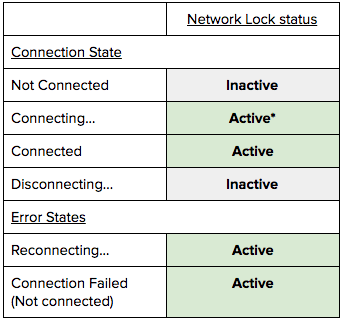 The following table is a summary of the scenarios when Network Lock is active or inactive. * It may take a few seconds for Network Lock to become active while the VPN is in the “Connecting…” state. 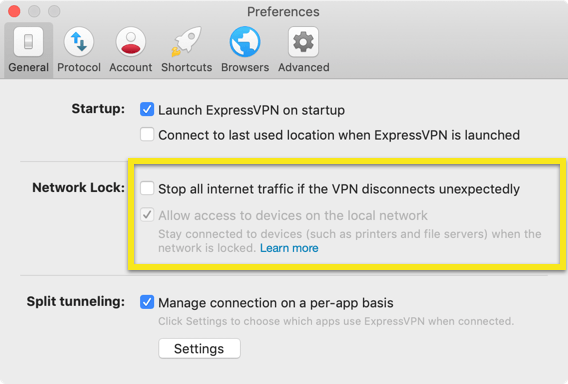 Note: There is no way to disable network lock on the ExpressVPN app for routers. Use the following instructions to disable Network Lock. When Network Lock is disabled, your internet traffic will not be blocked even if your VPN connection drops, so your traffic in those moments may no longer be encrypted and secured. 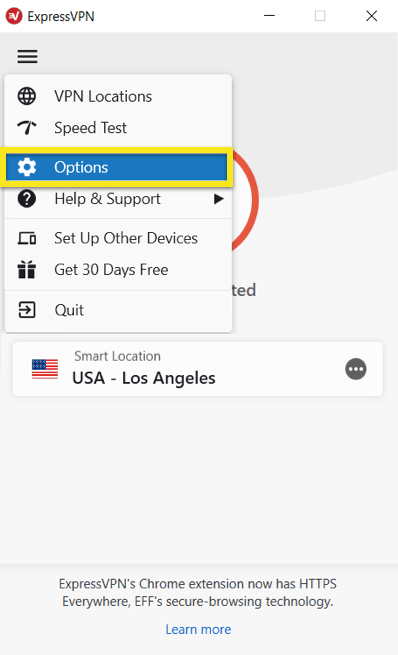 After disconnecting from the VPN, click the hamburger menu (≡), then click Options. In the General tab, uncheck the box for Stop all internet traffic if the VPN disconnects unexpectedly. 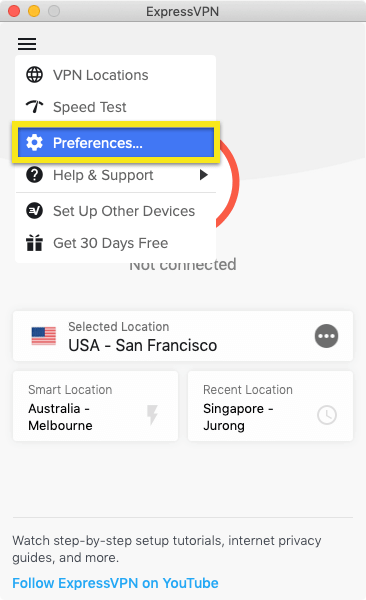 Click OK.
After disconnecting from the VPN, click on Options (≡), then click Preferences. 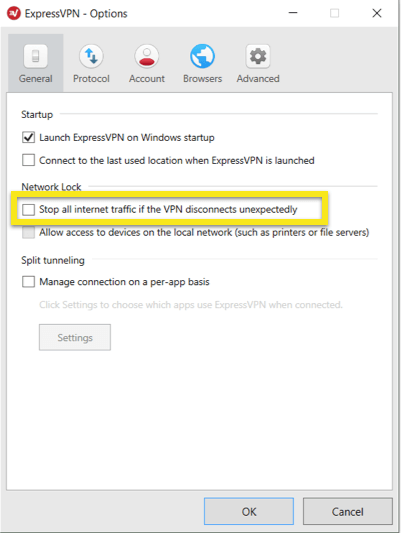 In the General tab, uncheck the box for Stop all internet traffic if the VPN disconnects unexpectedly, then exit the menu. Network Lock is now disabled. To enable Network Lock again, return to the General tab in the Preferences menu and check the box again. First, check that you are not connected to a VPN location and perform the steps highlighted above. Second, reboot your device and restart ExpressVPN. If you find that Network Lock is still enabled after you have disabled it or disabled after you have enabled it, follow the steps below. Click the “Force Quit” icon. It is possible to use Network Lock and maintain access to your local network devices. To do so, see the instructions below for your OS. By default, you will be able to access your local network devices while Network Lock is enabled.